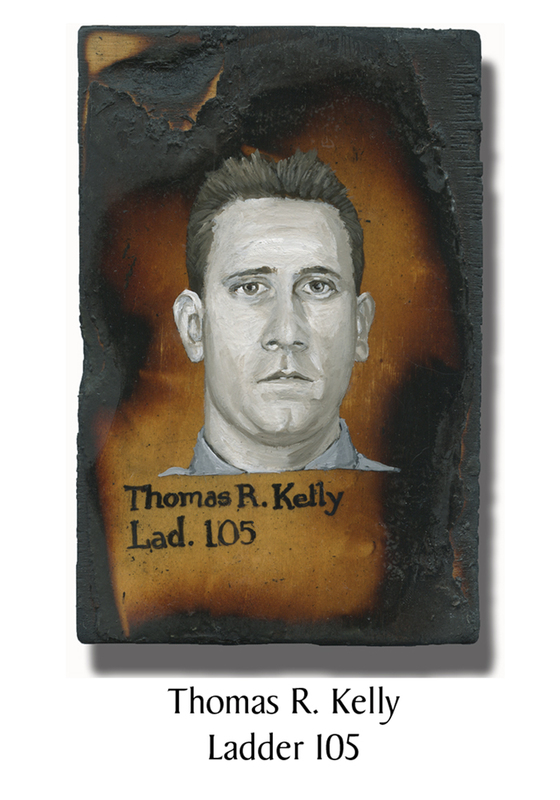 Thomas R. Kelly’s father and brother were also members of the FDNY. Kelly himself was an EMT before joining up. With a public moniker of the “Dean Street Heroes,” Ladder 105 in Park Slope is known within the department as “West Point” because of how many of its members rise up through the ranks. Thomas Kelly was to be one of them. He was posthumously promoted to Lieutenant that December. He had taken up bicycle riding with a passion in recent years. In 2000 he completed a 375-mile ride from New York to Boston for AIDS research. He had been planning a bicycle tour in France. Kelly and other members of Ladder 105 were last seen entering the South Tower shortly before it collapsed. Their remains have not yet been found. This entry was posted in Better Angels Stories and tagged 343, 9/11, better angels, Dawn Siebel, FDNY, firefighter, firefighters, firefighters of 9/11, Ladder Co. 105, LODD, Manhattan, memorial, NFFF, paintings, portraits, Thomas Kelly, World Trade Center, WTC. Bookmark the permalink.